A list of donors follows an agreement to establish the Wilmette Evangelical Association. Money was used to build a co-operative church at Lake and Wilmette Avenues, in Wilmette. The list includes the names of Wilmette's leading land developers and village fathers, each listed with the amount of the subscription and religious denomination. [p.2, line 1] ignate at the time of making his subscription 2 as hereinafter provided: and if any amounts 3 are left undirected they shall be divided 4 in the same proportion as those here designated. 5 [Section numbered] 6 Whenever any denomination mentioned in 6 this subscription and represented here to an 7 amount not less than one fifth [1/5] of the whole 8 shall see fit to organize a church and un- 9 dertake the maintenance of stated public 10 worship in the village of Wilmette it may 11 give notice of a desire to terminate this co- 12 partnership in church property to the Evan- 13 gelical Association of Wilmette or the officers 14 thereof. Then one of two courses shall be open 15 to the Association. First either to pay back to 16 the representatives of such denomination the 17 money that has actually been paid in in its 18 interest, or Second within six months of the 19 time of giving such notice this co-partnership 20 shall cease and determine and the following 21 steps shall be taken, to wit: [Subsection numbered] (1) The committee having the temporary guard- 22 ianship of the property shall proceed to sell 23 it at public auction on the premises public 24 notice of the time and place of sale having 25 been given for at least four weeks by posting 26 up such notice in four of the most public 27 places in Wilmette. [p.3, line 1] [Subsection numbered] (2) They shall divide the proceeds of such sale 2 among the religious denominations represented 3 in this copartnership according to the a- 4 mounts actually paid in in their interest 5 giving to each [damaged] prorated [underlined] share. 6 [Subsection numbered] (3) These amounts shall be paid to the 7 trustees of such denominations in Wil- 8 mette provided churches have been organ- 9 ized and Trustees elected otherwise they shall 10 be paid to the Trustees of the First Church 11 of each of these denominations respectively 12 in the town of Evanston to be held sacredly 13 in trust to be used for the erection of church 14 edifices for the benefit of such denomination 15 in the village of Wilmette. 16 [Subsection numbered] (4) Should any denomination become the 17 purchaser of this church property at such 18 sale, when it shall have complied with the 19 conditions above specified the Trustees or 20 Executive Committee of the Evangelical 21 Association of Wilmette shall convey 22 the property to them to be held by them 23 for their sole use and benefit. 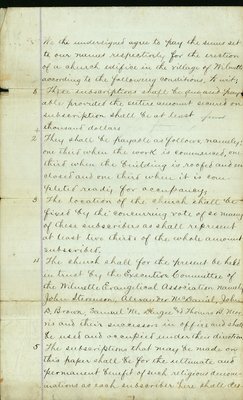 24 To all of which above mentioned condit- 25 ions we hereby agree, and on these conditions 26 we agree to pay the sums set to our re- 27 spective names 28 Dated this 12th day of July, 1872.